M. N. Krish is an expert in data science and predictive analytics who has spent much of his life teasing stories out of numbers to do anything from scheduling planes to selling insurance (not simultaneously). He has turned into a novelist with the launch of his offbeat thriller The Steradian Trail: Book #0 of the Infinity Cycle, which has been getting rave reviews since release. 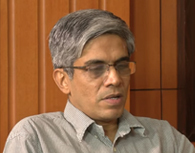 Krish holds a BTech from IIT-M ( BT/1995/CE ) and dual MS degrees from MIT. He is back in India after a long time abroad and is getting his feet wet in the startup scene. He can be reached via www.mnkrish.com.